The three convicts awarded life imprisonment were Rocky Yadav, Teni and Rajesh Kumar. They were convicted under Sections 302 (murder), 120-B (criminal conspiracy) of the Indian Penal Code. All the sentences will run concurrently. All the accused have also been convicted under the Arms Act. A Gaya district court on Wednesday handed over life imprisonment to Rocky Yadav and two others in the Aditya Sachdeva road rage murder case of May 7, 2016. His father, Bindi Yadav, has been sentenced to five years imprisonment. All the accused were convicted on September 1 by the same court, five days head of the deadline given by Supreme Court to conclude the trial. The court of Additional Sessions Judge-I, Sachidanand Singh, pronounced the quantum of sentence on Wednesday after hearing the pleas from both the sides. While the prosecution had sought capital punishment in the case, the defence had pleaded for leniency. 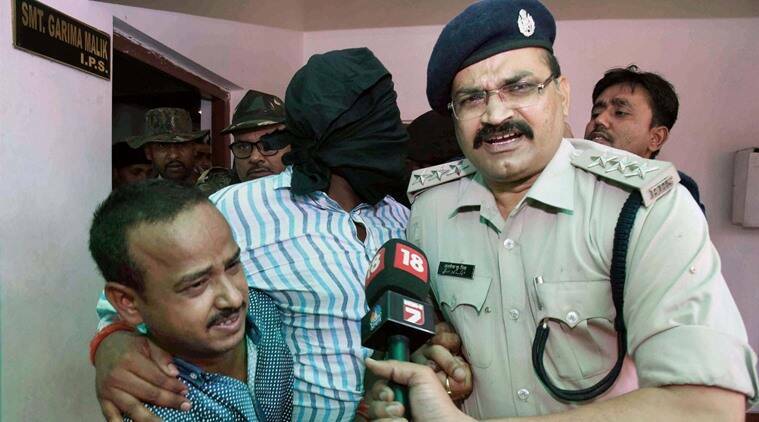 The three convicts awarded life imprisonment were Rocky Yadav, Teni and Rajesh Kumar. They were convicted under Sections 302 (murder), 120-B (criminal conspiracy) of the Indian Penal Code. Besides, Rajesh, who was the bodyguard of Rocky’s mother Manorama Devi (then an MLC), was also convicted and sentenced for two years imprisonment under Section 217 (public servant disobeying instructions of law to save a person from punishment). All the sentences will run concurrently. All the accused have also been convicted under the Arms Act. In December 2016, the case appeared to be floundering as all the occupants of the car in which Aditya, son of Shyam Sachdeva, a businessman in Gaya was present, had turned hostile as prosecution witnesses. Mohammad Nasir, who was driving the car, and three other friends of Aditya, had retracted their statements, made before a magistrate under Section 164 of the Criminal Procedure Code (CrPC). “They turned hostile, but they had not completely denied the sequence of events. This helped us, besides the forensic and other evidence that we produced before the court,” said Khan. Prior to that, in October 2016, the then state government (when JD (U), RJD and Congress were in alliance); had come under fire when Rocky got bail from the Patna High Court on October 19. Following hue and cry, the government challenged the order in the Supreme Court, which cancelled his bail on October 28, as a result of which Rocky was back in judicial custody seven days after being released. Additionally, the Supreme Court also set a deadline of September 5 for concluding the trial. Earlier, the chargesheet in the case was filed in the month of June 2016. It had all started on May 7, 2016, when Aditya, with three of his friends, and one Mohammad Nasir (who was driving the car), were going in Maruti Swift car when they overtook the SUV, in which Rocky Yadav, his associate Teni and Rajesh Kumar, the bodyguard of his mother, were going. Infuriated Rocky overtook their car and tried to intercept them. He got down from the car and got into an argument. When Nasir tried to speed away, Rocky fired from behind and the bullet got lodged in Aditya’s neck. The incident had occurred under Rampur police station of Gaya district. Aditya, a class 12 student, had gone to Bodh Gaya and was returning when the incident occurred late evening. While the police had arrested Rocky, Rajesh, Teni and Bindi, his mother was later booked in a case of recovery of liquor from her house. She was also suspended from the Party.